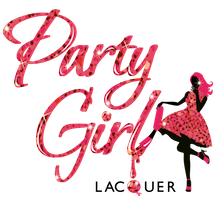 Party Girl Lacquer is hand poured custom made nail polish. Inside each bottle includes one 6mm stainless steel ball, "3 Free" (Toluene, Formaldehyde, Dibutyl Phthalate) suspension base, and solvent resistant glitters. Each bottle has 13.2 mL/.45 oz inside a durable thick glass wall bottle with an italian made wide brush and cap.